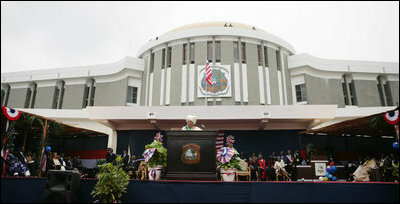 Liberian President Ellen Johnson Sirleaf addresses the audience at her inauguration in Monrovia, Liberia, Monday, Jan. 16, 2006. President Sirleaf is Africa's first female elected head of state. Mrs. Laura Bush and U.S. Secretary of State Condoleezza Rice attended the ceremony.